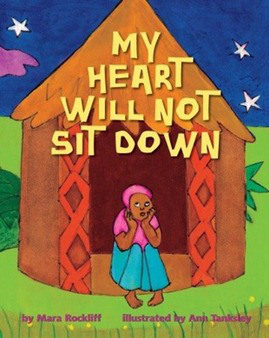 Ann Tanksley is the illustrator of My Heart Will Not Sit Down (Knoff, 2012), written by Mara Rockliff. Ann is a fine artist who graduated from the Carnegie Institute of Technology (now Carnegie Mellon University). 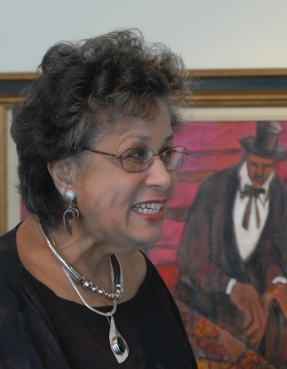 She is the illustrator of the picture book The Six Fools by Zora Neale Hurston, and the creator of a series of monoprints based on the writings of Hurston titled, “Images of Zora,” which Maya Angelou described as “dazzling.” She lives in Great Neck, New York. Tanksley’s lush, vibrantly colored paintings, . . . take seemingly simple images and render them big, beautiful and bold. Tanksley’s pared-down, childlike pictures provide a sketch of Cameroon village life, their electric hues of orange, magenta, and scarlet jumping from the pages.